“That’s not true!” Dagmar gasped, with a flare of nationalistic pride. “Our Balls are for Viennese, even though other people can attend. You must come and see for yourself.” And so Dagmar and I arranged an exchange, not of homes, but of dreams, both eagerly diving into our new role of fairy godmother. 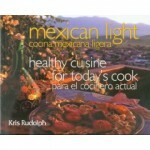 Dagmar came to Mexico to experience the vibrancy of Mexico City, the laid-back beaches and surfing culture of the south, as well as the beauty of Oaxaca at Christmas with its famed Radish Festival. On New Year’s Eve, when I was short-handed at my restaurant, she volunteered to waitress. Ok, that probably wasn’t part of her dream, but as an international banker, she confessed, she enjoyed the hopefully once in a lifetime opportunity. When it was my turn. I packed a large suitcase, along with winter boots and a wool hat—it was February after all–and headed to Vienna for the Kaffeesiedler Ball (appropriately dedicated to café owners). The Viennese Ball season runs from December 31st to the eve of Lent. Each Ball is dedicated and organized by a different guild, or professional association. 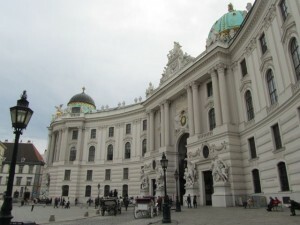 Opening the palace and other prestigious venues for carnival season dates back to the 18th century when commoners were first allowed to enter the Hofburg and participate in events formerly reserved for royalty. The night of the big event I entered the Imperial Palace through two intricately carved wooden doors. I climbed the opulent, marble staircase, carpeted in red for the evening, and took a fan from a silver tray offered by a man in period dress. I nodded in gratitude, following the example of the women ahead of me. On the top landing, a string quartet played a lively tune from Haydn, adding to the excitement in the air. I strolled among minor royalty and statesmen and the crème de la crème of Viennese society, along with commoners, such as myself, eyeing the people around me. The men were dressed in tuxes and in tails. A few had checked in stunning top hats and white cashmere scarves. They were of all ages—young escorts for the debutantes to white-haired gentlemen with medals of honor and accomplishment pinned to their chests. The military officers were dressed in full uniform, accented with thick gold braids and shiny brass buttons. The heads of State wore impressive red and white ribbons around their necks. It could have easily been 1900, if it were not for the advanced dental hygiene and women attired in ball gowns of every possible color and style. It wasn’t the array of black that I had expected, rather a rainbow of lively shades of red, orange, and purple. There were a few traditional Austrian dresses with full skirts and shoulder pleats, as well a handful of backless numbers that dipped shockingly low. There were opera gloves, mostly white, but also colored, and a few rhinestone tiaras. The Ball officially began with the procession of debutantes, a 100 in total, all in simple white dresses. 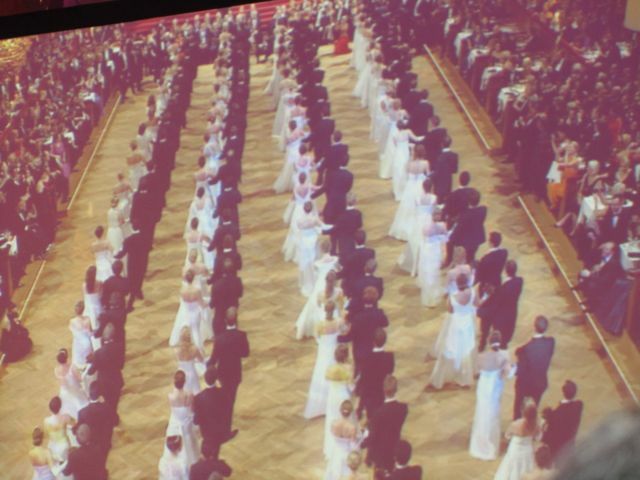 They were escorted onto the ballroom floor and danced with their partners in a perfect, well-rehearsed formation before everyone else joined in. And speaking of gentlemen, I know what you’re thinking. Who was she dancing with? Well, being an excellent fairy godmother, Dagmar supplied me with a blind date. 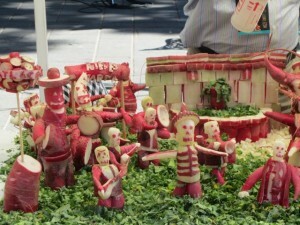 A man who could not only dance, from cha cha to rumba, foxtrot to waltz, but also loved sweets. Having a date in German, a language I hadn’t really spoken in 25 years, proved to be quite the challenge, but I managed well, dazzling him with my limited vocabulary and well-crafted conversation: “Do you like apple strudel? 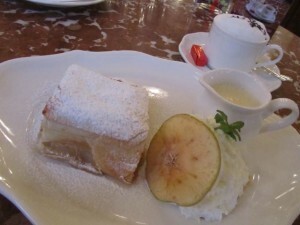 I like apple strudel. How about cherry?” He preferred poppyseed. I relayed to him a riveting historical account of the Gugelhopf, he countered with the Punschtorte. Yes, we did have a lot in common. 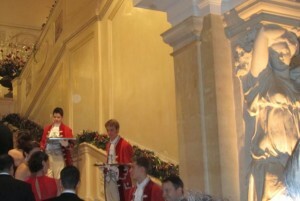 When the Ball ended, we exited the palace into the snow, where we came across a few requisite horse and carriages. However, in our modern world they were greatly out-numbered by taxis. We slipped into the night, in anticipation of our trip to Budapest. 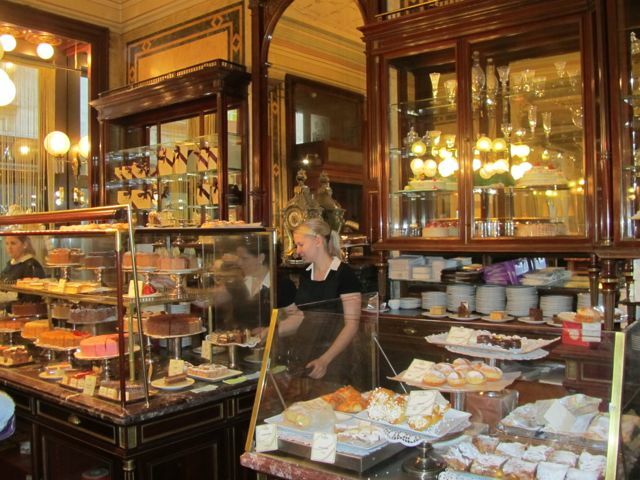 And did I mention I indeed got to eat lots of cake, the best in the world, in the famed coffeehouses where Mozart, Mahler, Freud and Klimt sat and chewed before me? This entry was posted on Monday, March 9th, 2015 at 7:11 pm	and is filed under Austria/Hungary. You can follow any responses to this entry through the RSS 2.0 feed. You can skip to the end and leave a response. Pinging is currently not allowed.